After a weeks-long round of hole-drilling and laser-zapping, NASA's Curiosity rover is packing up its sample rock dust and getting ready to resume its road trip to a Martian mountain. 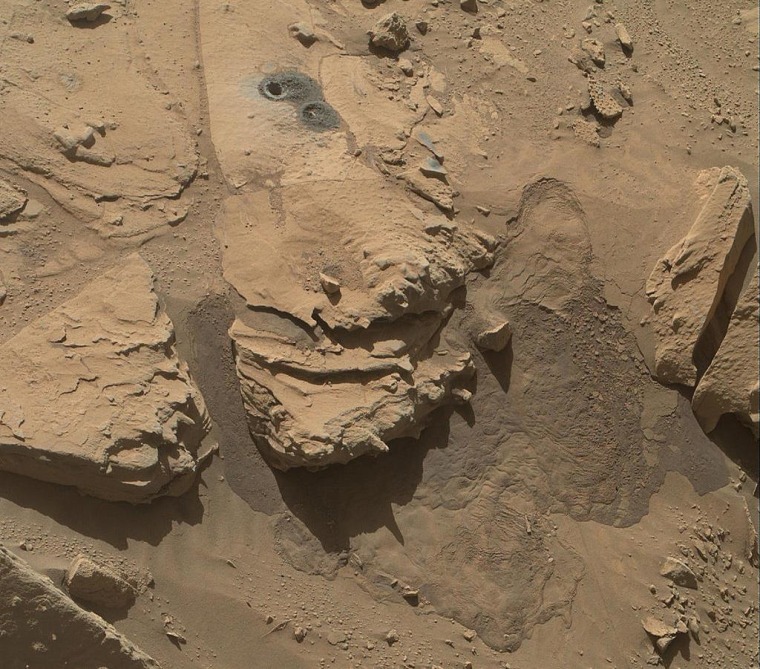 Curiosity's onboard drill bored a half-inch-wide, 2.6-inch-deep hole into a sandstone rock nicknamed Windjana, and then used its ChemCam instrument to blast a series of laser shots into the hole's wall as well as two other rock-sampling targets (called "Stephen" and "Neil"). ChemCam can analyze the light given off by those blasts to figure out what the rock is made of. Two other instruments, SAM and CheMin, will perform different types of chemical analyses on the rock dust that was gathered up from Curiosity's drill tailings and stored aboard the rover. Past such samplings have revealed much about Mars' ancient habitability. Those chemical studies can be conducted during future breaks in Curiosity's journey toward 3-mile-high (5-kilometer-high) Mount Sharp, also known as Aeolis Mons. The 1-ton, six-wheeled rover is expected to resume its 5-mile (8-kilometer) trek within days. Mission managers expect Mount Sharp's layered rocks to provide key insights into the geological history of the Red Planet — and whether it had all the chemical building blocks needed for life.